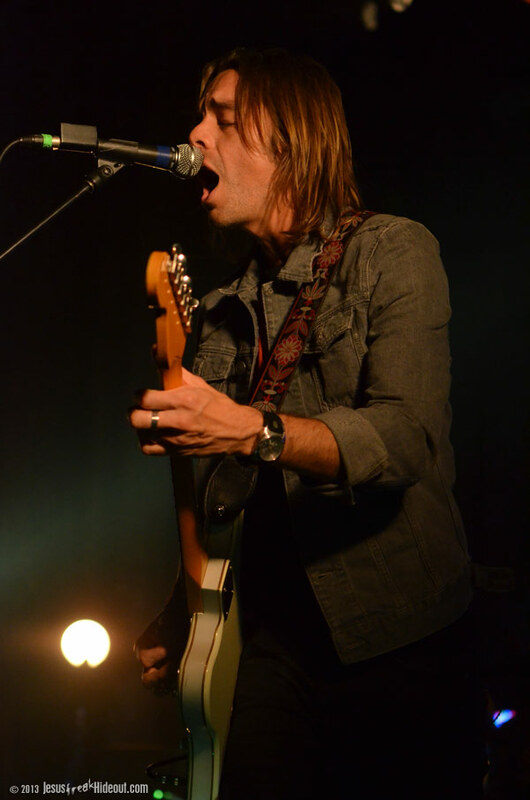 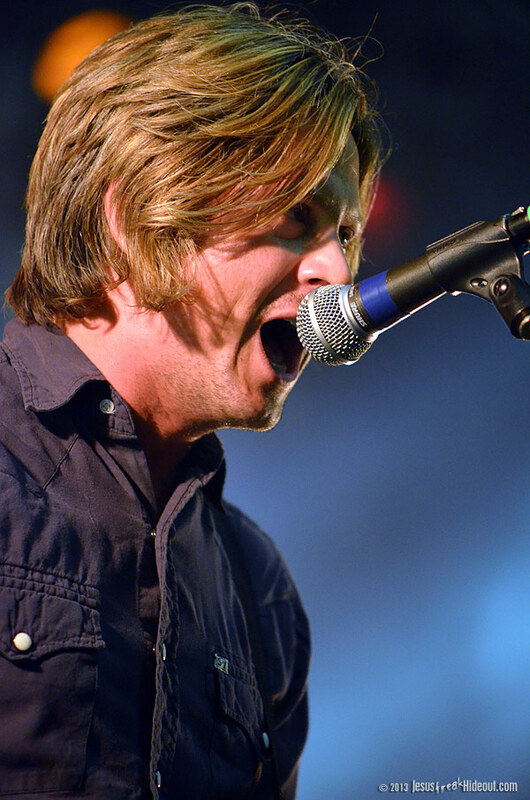 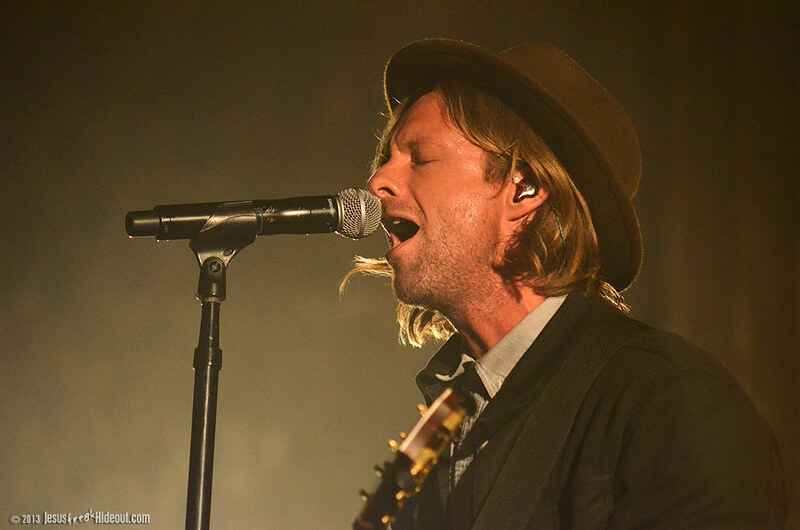 Since the release of their eighth album, Vice Verses, rock band Switchfoot has been talking about making a film as the next creative step in the band's long career. 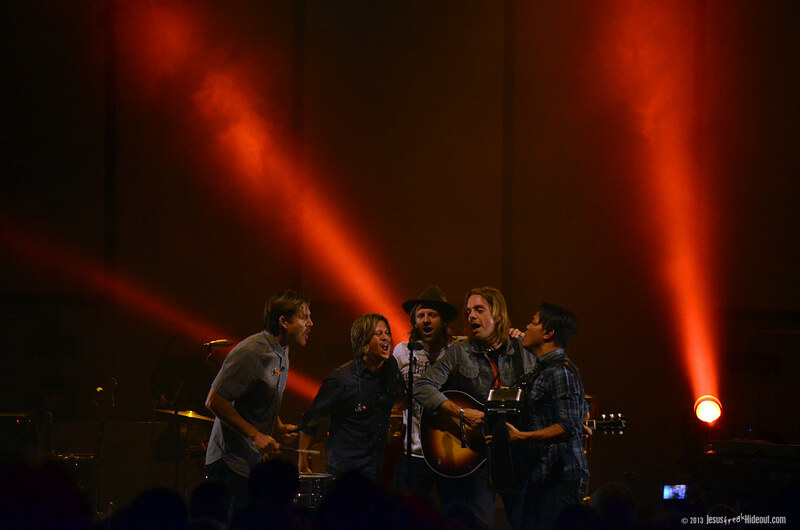 For their 2012 world tour, the five guys took a film crew out on the road with them to Australia, New Zealand, South Africa and Bali to chronicle their experiences in these foreign lands -- on stage and off. 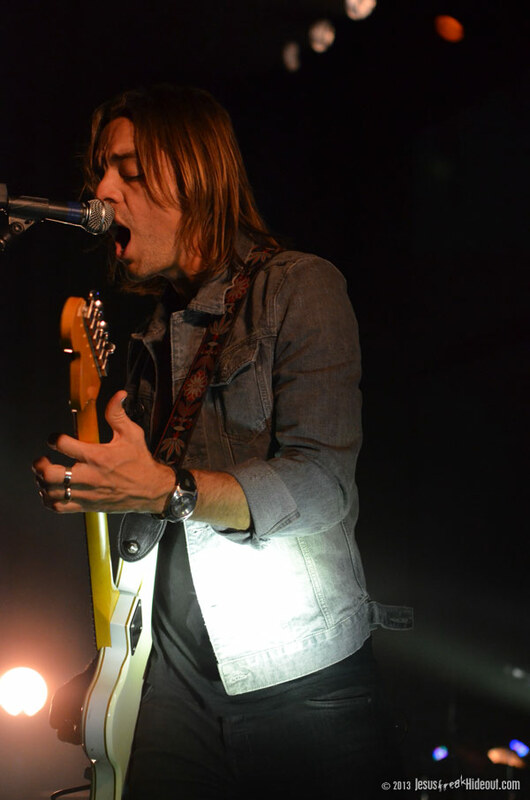 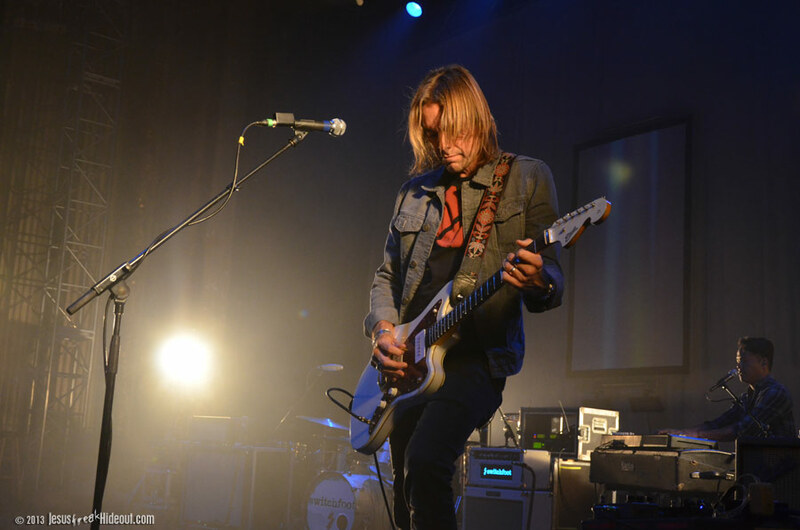 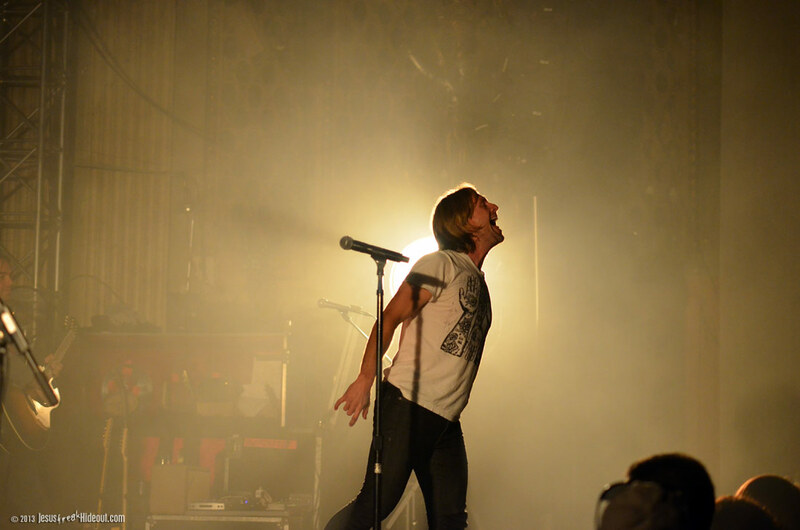 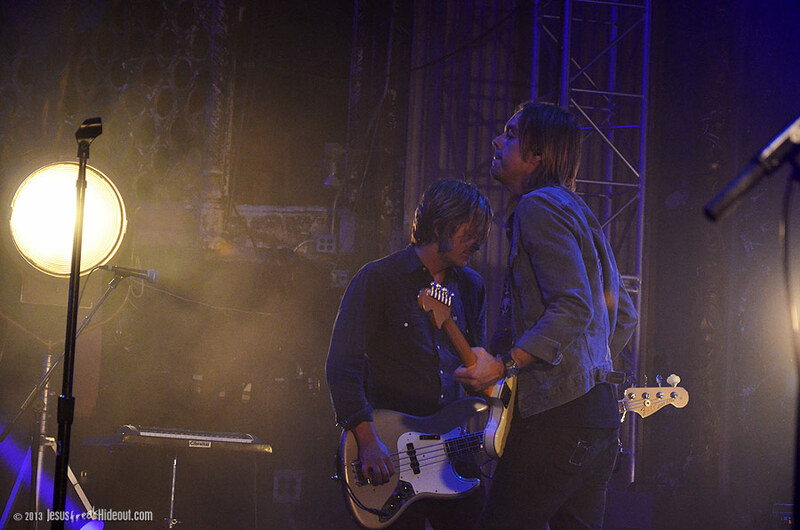 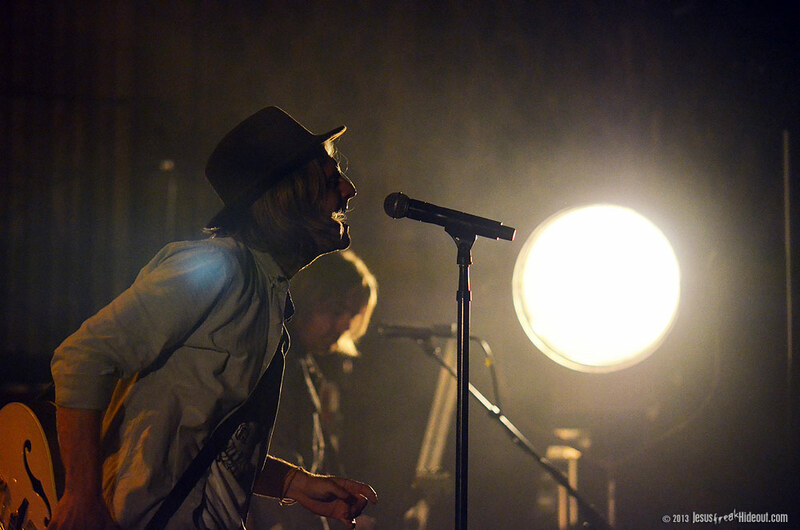 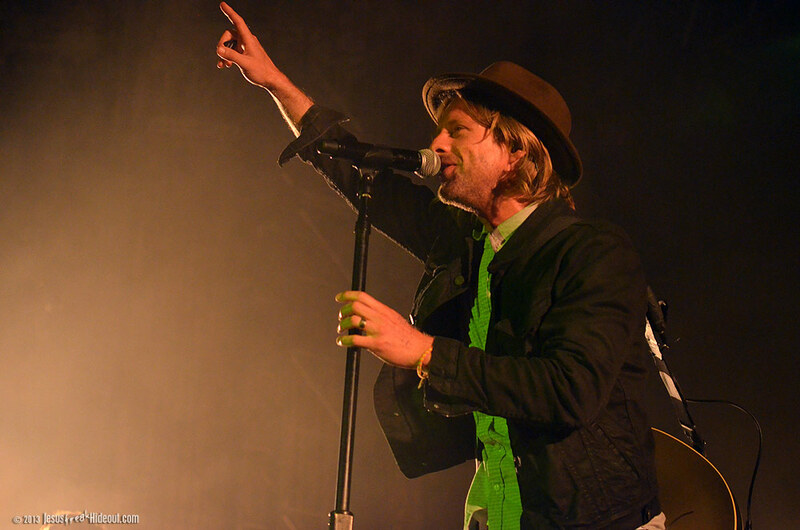 To celebrate the completion of the film, Switchfoot launched the Fading West Fall Tour to serve as part movie-screening, part concert, bringing intimate performances to key locations across the United States. 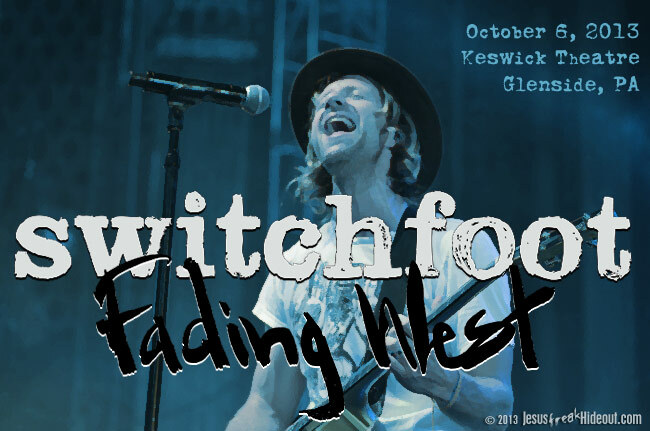 With the film not hitting digital retailers until December, this tour is the only place fans can get a glimpse of Fading West. 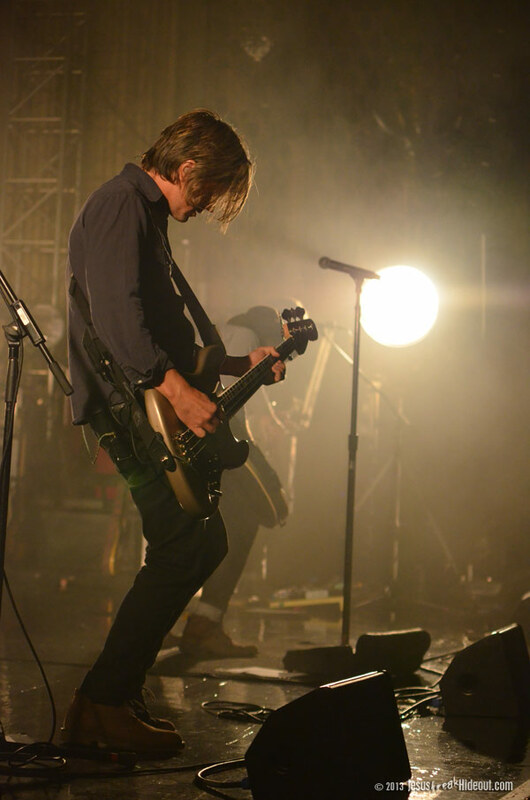 With a special VIP event two hours before show start, doors opening an hour before, and the actual start time being 7:30, the movie went underway almost right on schedule. 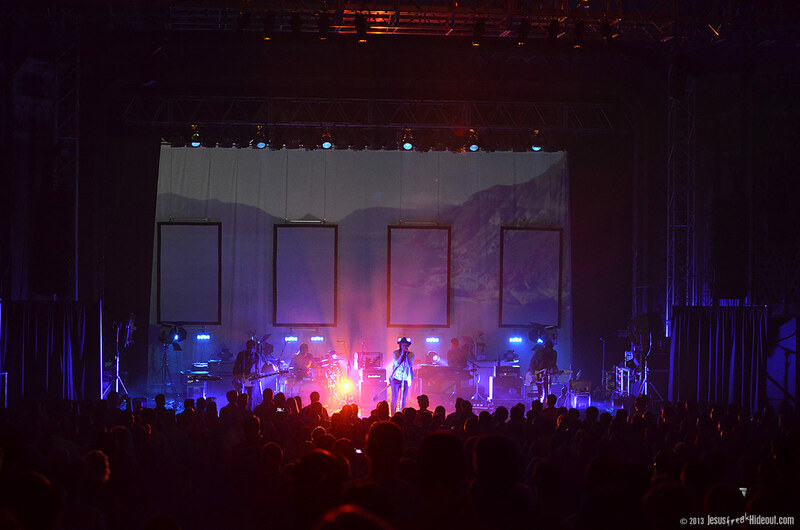 A homemade movie screen was erected in the middle of the stage, displaying an average-sized screen in front of the band's stage setup. 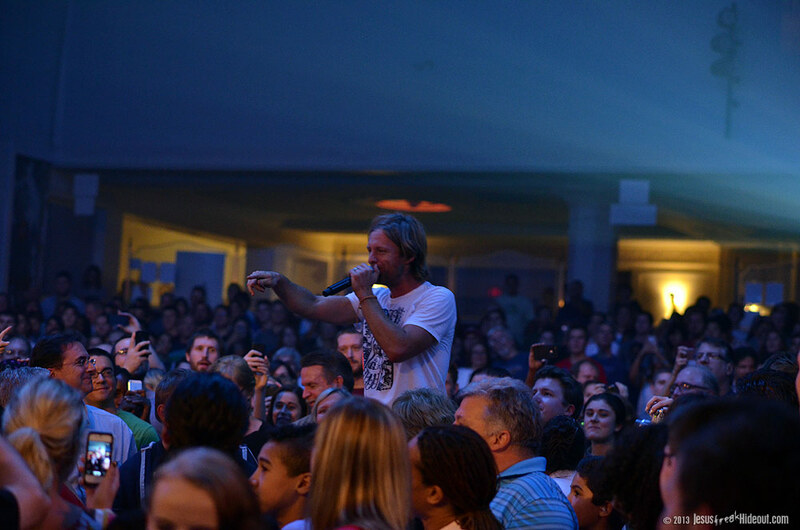 (It'd be huge if you're in the first couple rows, and more like watching it at home--or on your smart phone--if you were sitting in the back.) 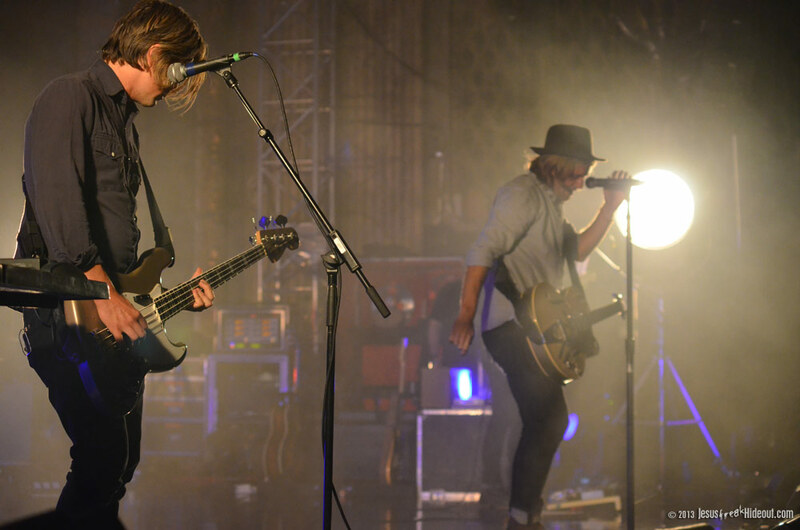 The sound wasn't super great; it was a little difficult to hear some of the dialog at times, especially with the crowd laughter and cheers, but it was still cool to see the film within a sea of Switchfoot fans. 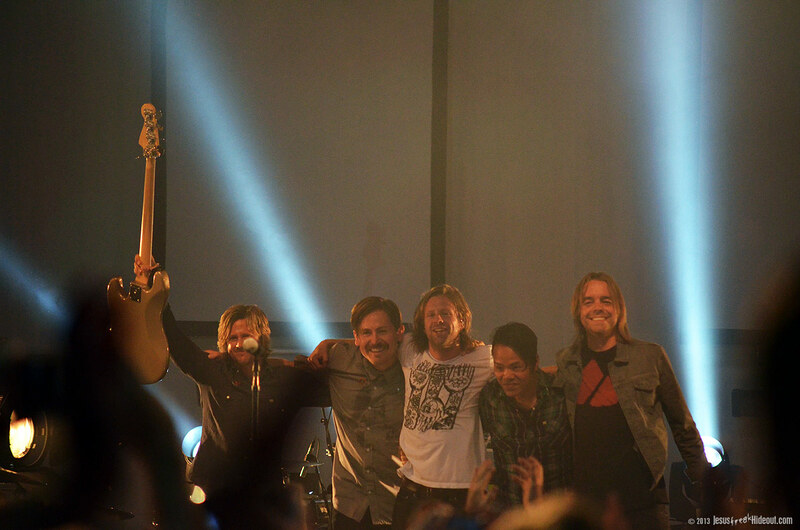 The movie started after a brief video intro by the full band, and a couple sponsors' commercials, and then drummer Chad Butler and guitarist Drew Shirley came out to give it a brief introduction in person (including Chad telling the audience to cheer whenever there's a big wave on the screen). 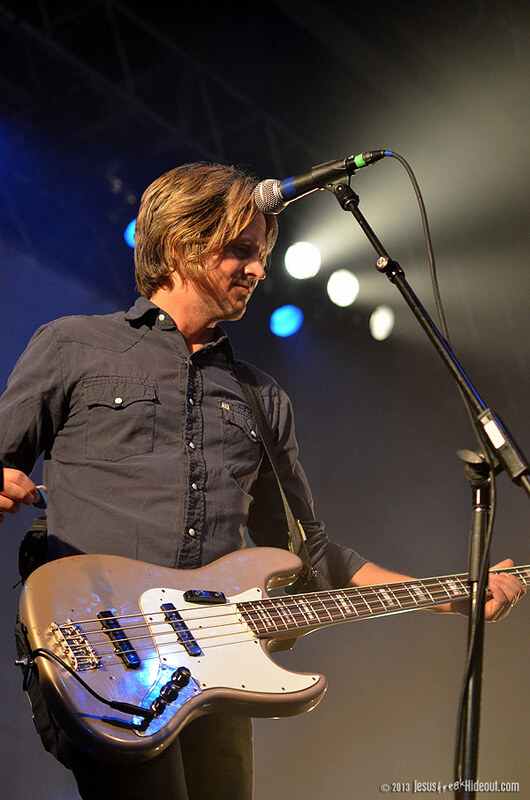 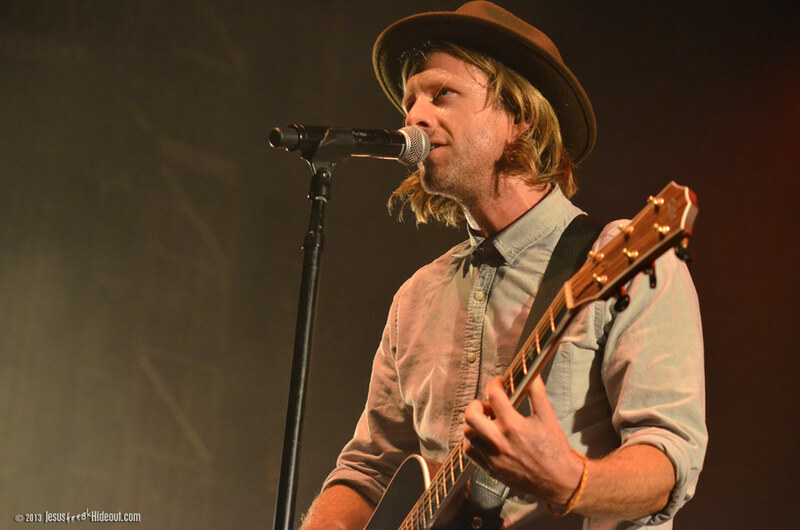 Drew also told the audience to tweet questions to their Switchfoot Twitter account following the film for the band to choose a couple from and respond to during their show. 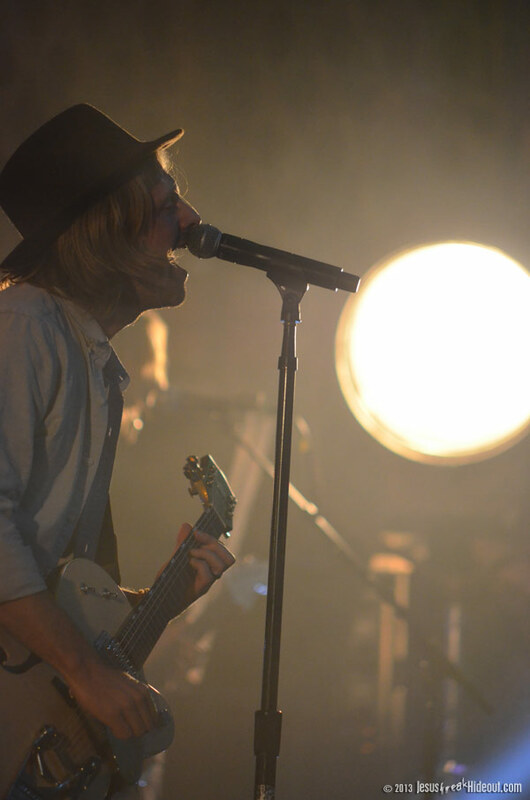 For a full review of the movie itself, click here. 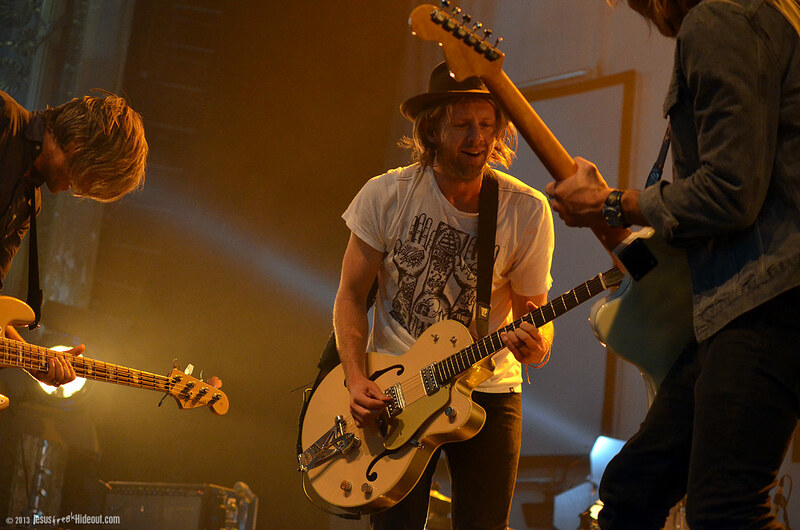 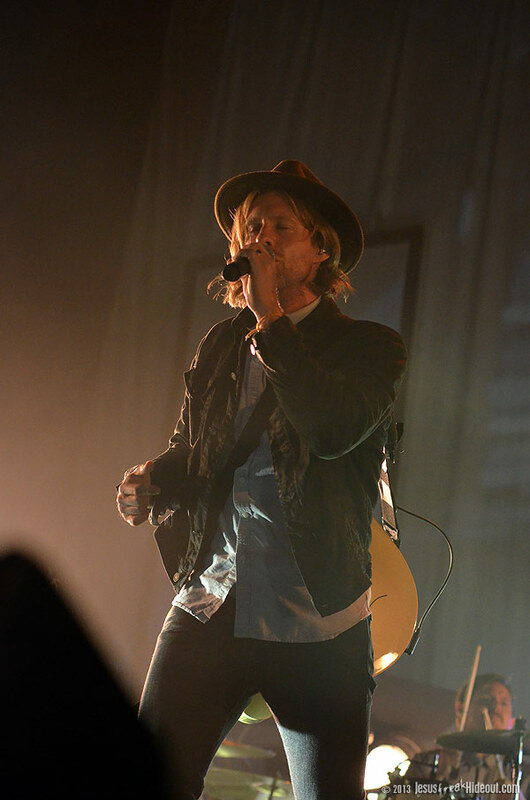 There was a brief, 15 to 20 minute intermission after the film (which was about an hour and 20 minutes), before Switchfoot emerged to play a stripped-down set of music. 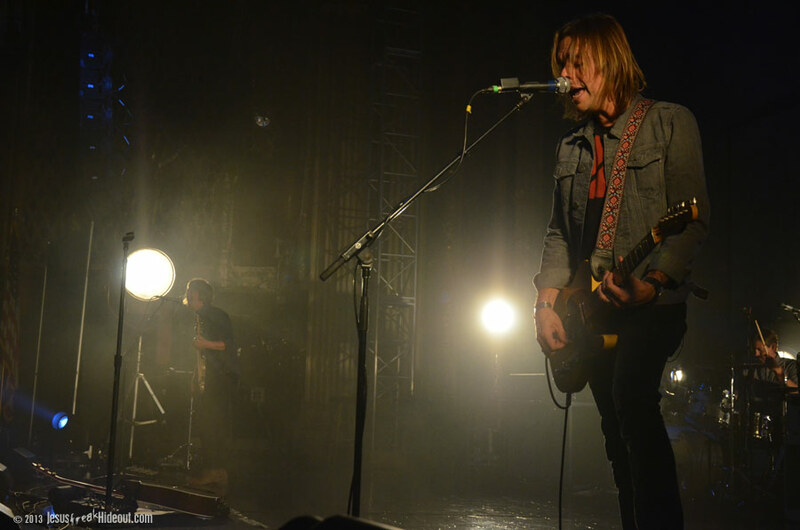 Fans may have noticed a subtle difference right from the start, however--not including the more acoustic presentation. 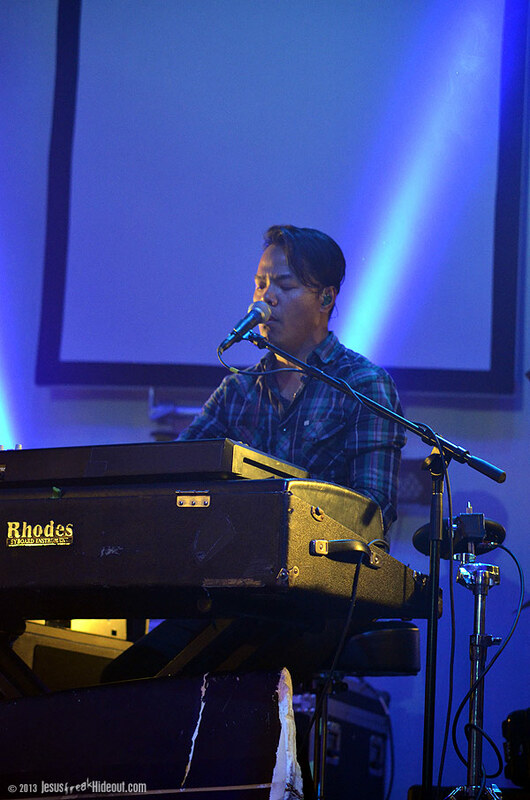 Keyboardist Jerome Fontamillas was absent and a familiar face from Jerome's personal musical career was standing in his place instead on keys and accordion. 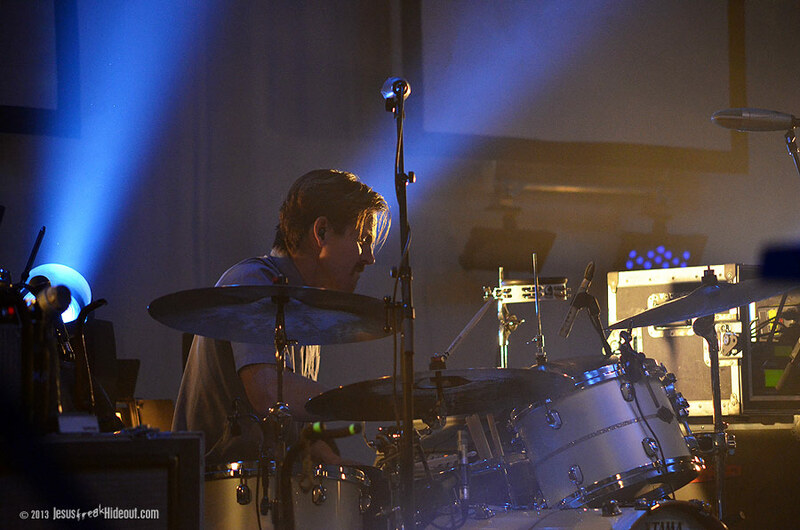 90's CCM fans might have recognized Jyro Xhan from Jerome's former band Mortal (1988-1996, and later in 2002). 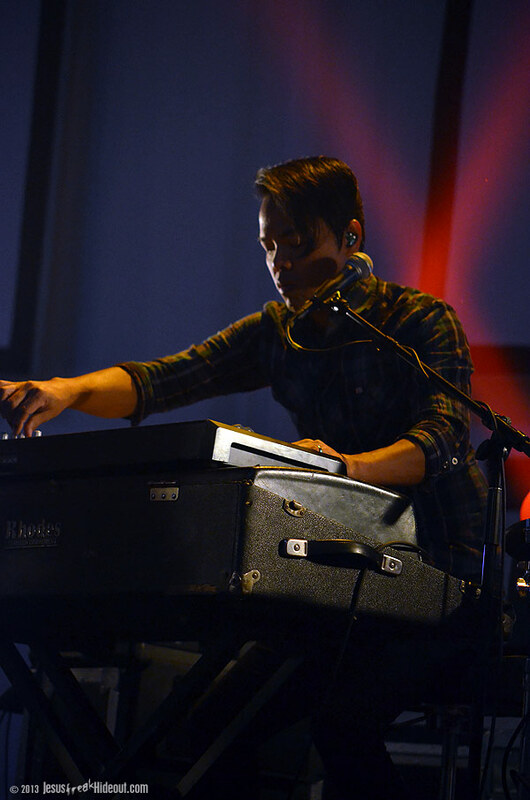 Jerome was temporarily off the road due to a new baby addition to his family, and Jyro graciously filled in. 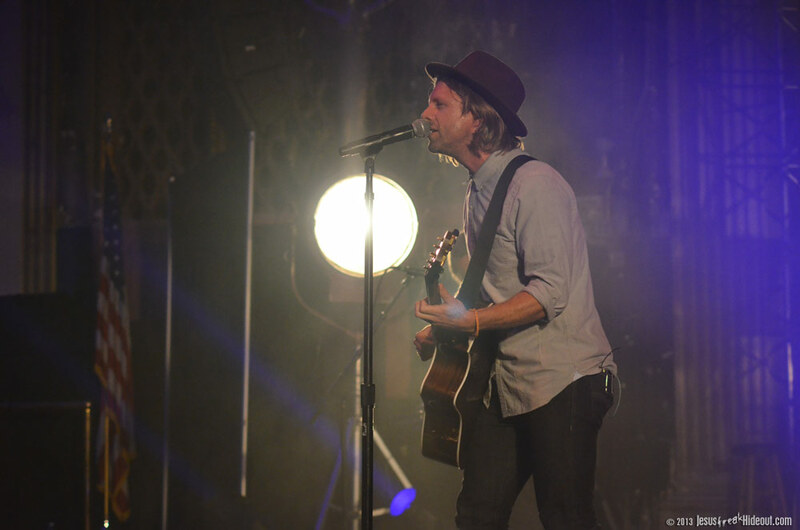 With bright spotlights bookending the sides of the stage and Jon Foreman taking front and center, the quintet opened with an acoustic rendition of "The Sound," from their album Hello Hurricane. 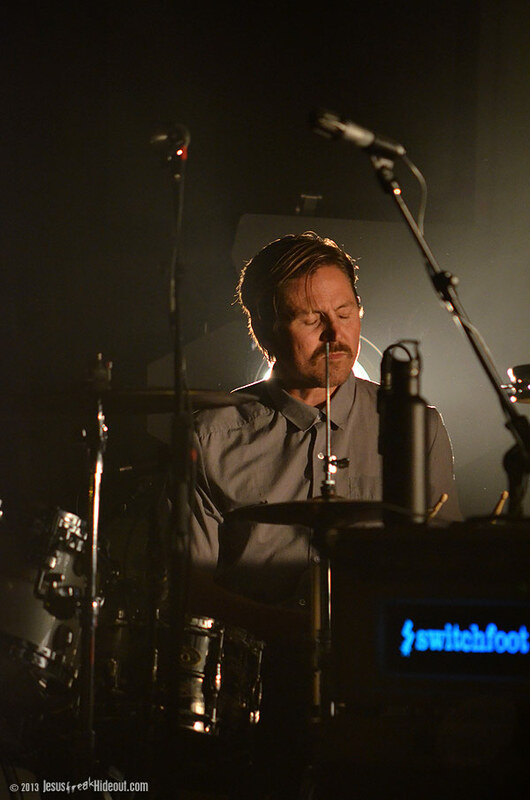 Following "The Sound," the band plugged in a bit for new Fading West song "Who We Are," after a warm greeting to the PA audience from Foreman. 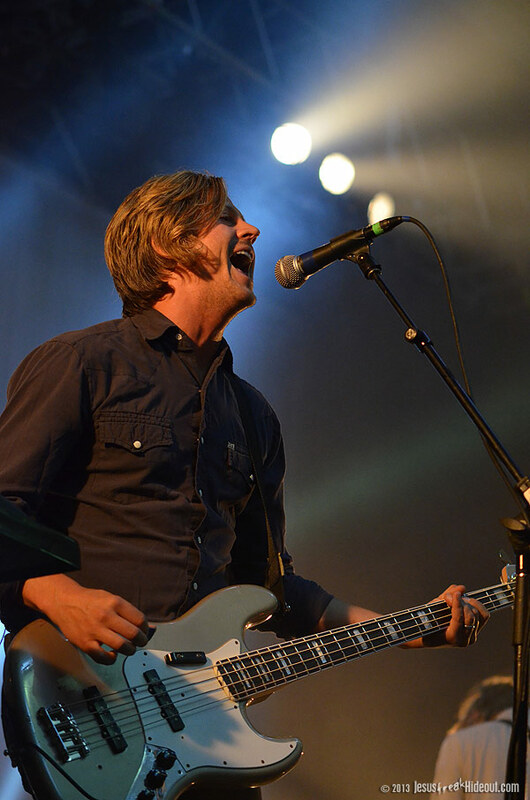 Jon expressed that Pennsylvania is one of their favorite places to play since it was one of their first-ever headlining shows they'd ever performed. 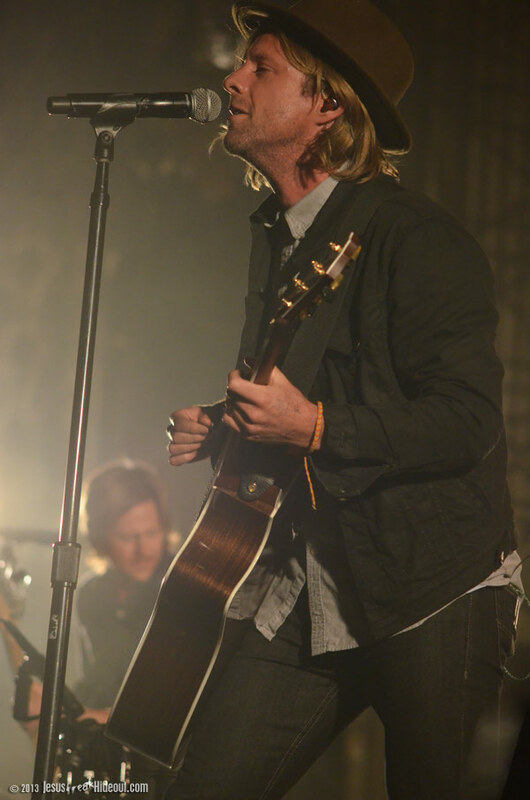 After the new song, they answered a couple of the questions from Twitter and then presented "Meant To Live" in an entirely acoustic fashion, something Jon said the east coast hasn't heard too often. 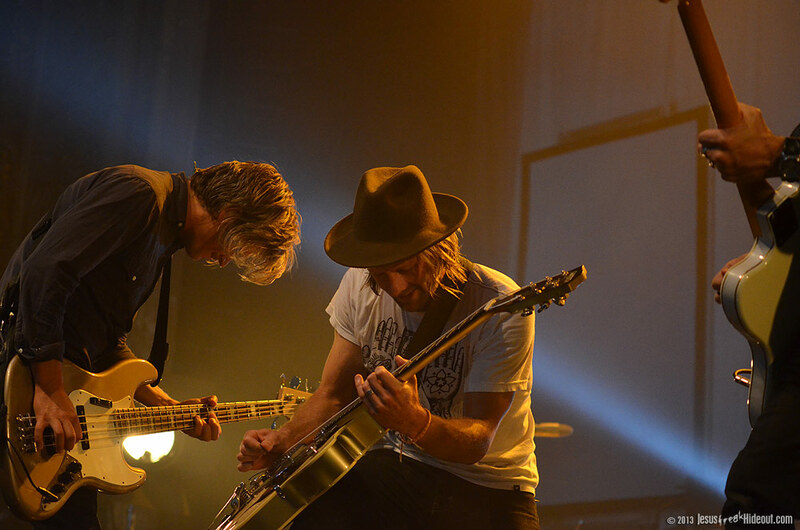 After that, Foreman said that because of how PA is such a special place to them, they wanted to play a new song for the first time ever live and performed "Ba55" from the new EP/album, Fading West. 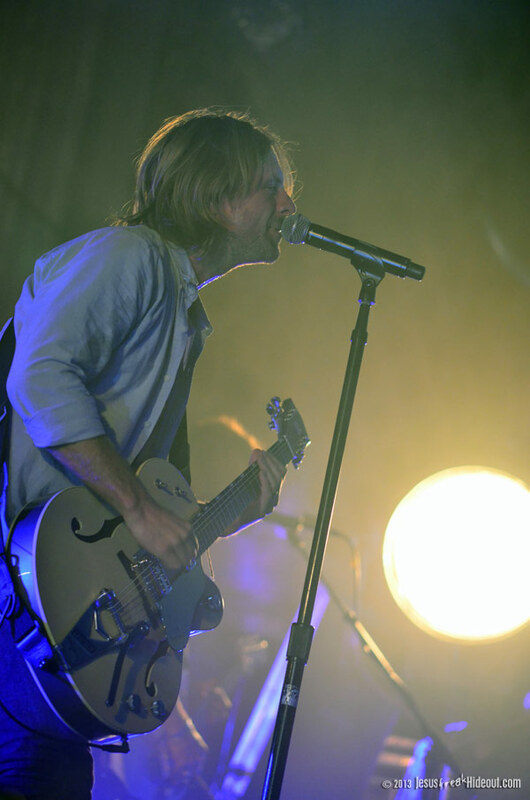 It sounded great live, and when they were supposed to return to the acoustic format for the next song, Jon insisted that it felt so good to play electric that they wanted to perform "Dark Horses" full-on electric. 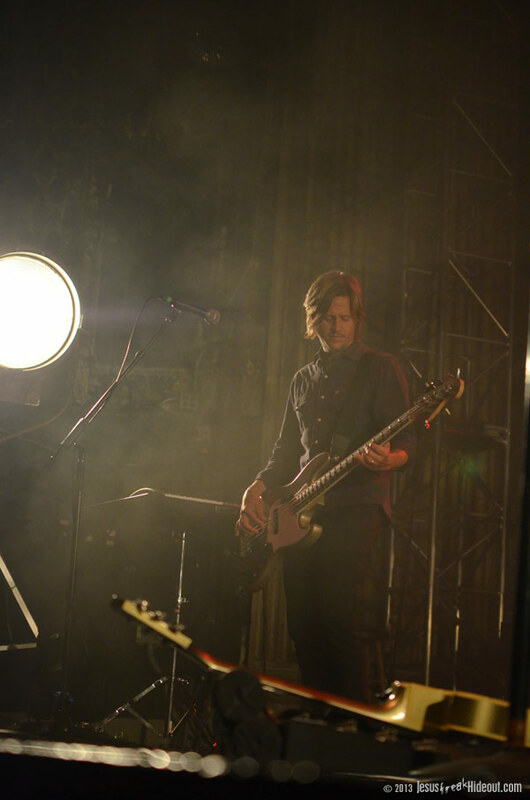 Jon then introduced the band members and addressed Jerome's absence officially and answered a few more questions--including singing 'happy birthday' to a fan who requested it for a friend. 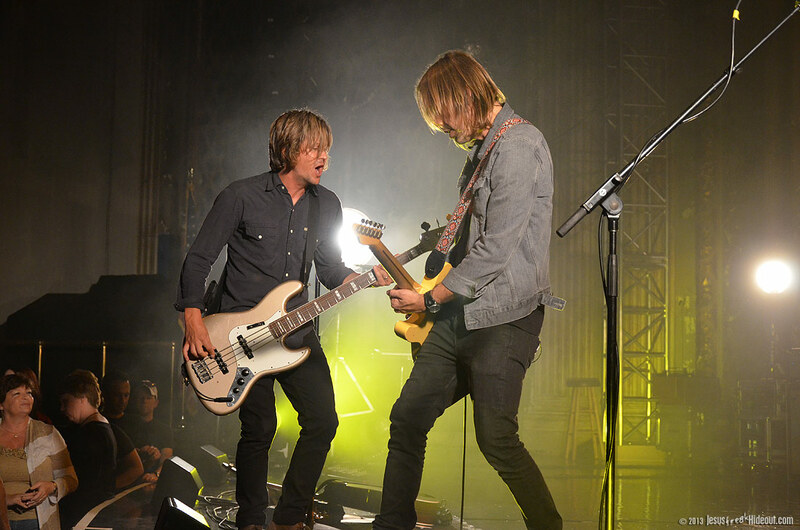 Another Twitter question had asked about how one might be able to get a surfboard personally designed by Jon. 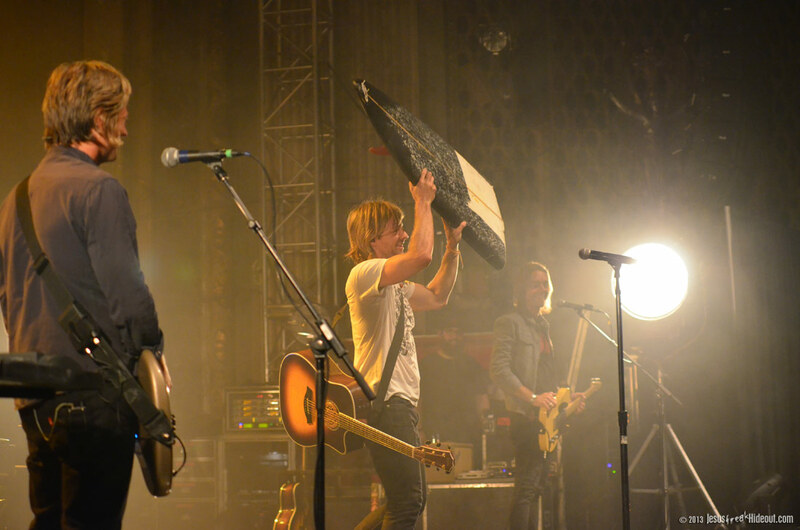 As a joke, Foreman went backstage and emerged with half of a broken surfboard--the same board that snapped in two as seen in the Fading West film. 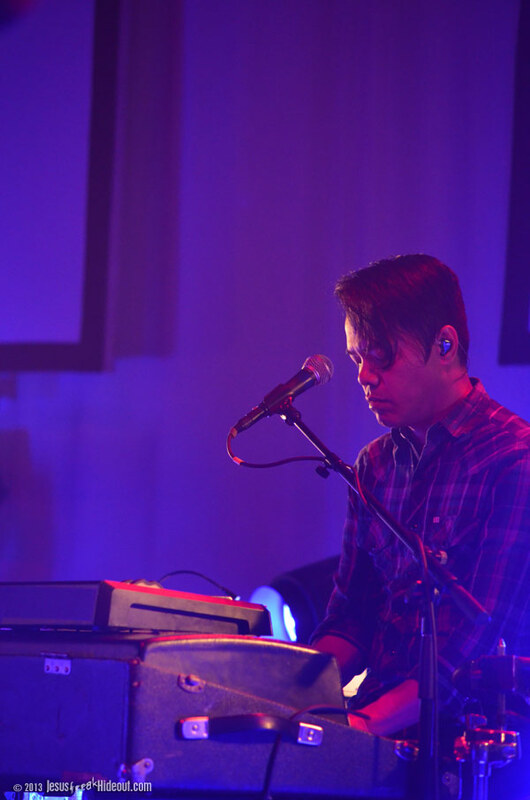 He then said he didn't make the board but he did break it, and then set it down in front of Jyro's keyboards for the remainder of the set. 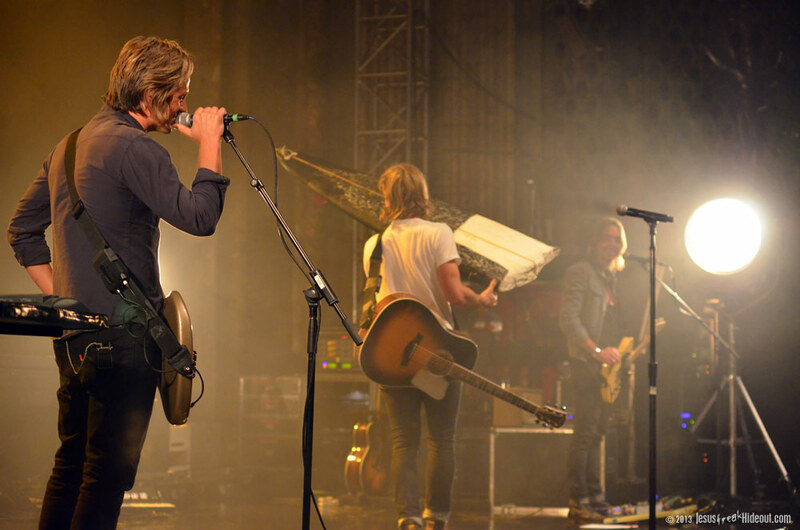 They then approached "Dare You To Move" as being acoustic and Jon stopped and asked if, since there was a drummer present (in Chad Butler) if we'd want it played fully electric. 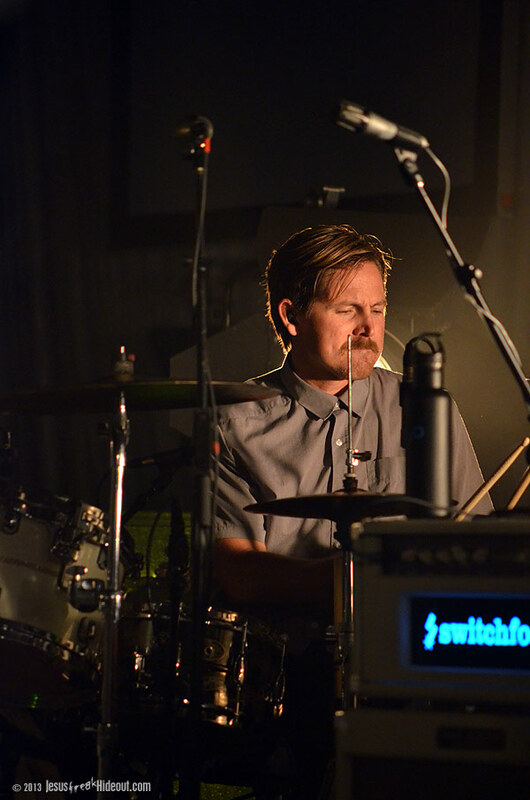 The audience was pretty intensely supportive of that notion and the band proceeded to perform it as a full band, "plugged in." 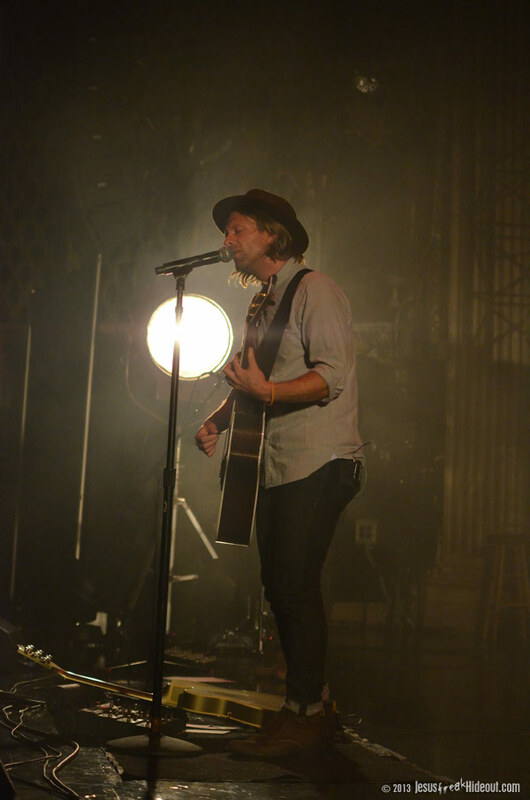 Jon ventured out into the audience to sing along with fans before returning to the stage and ending the first part of the set. 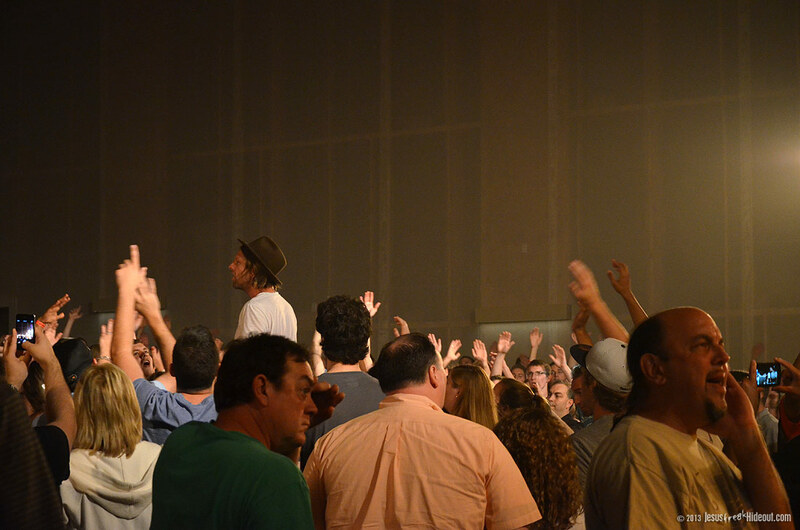 They then waved goodbye and walked off. 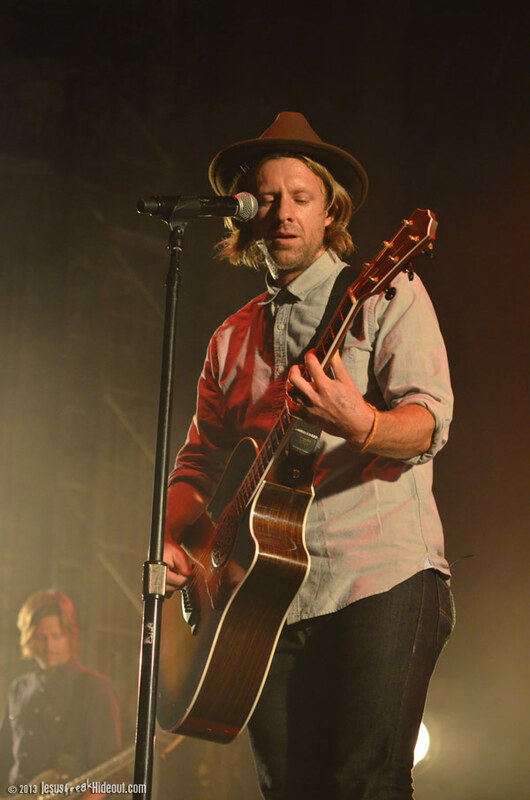 Six songs seemed like an unusually short set, especially for Switchfoot, so it was no surprise that they soon came back out for an encore. 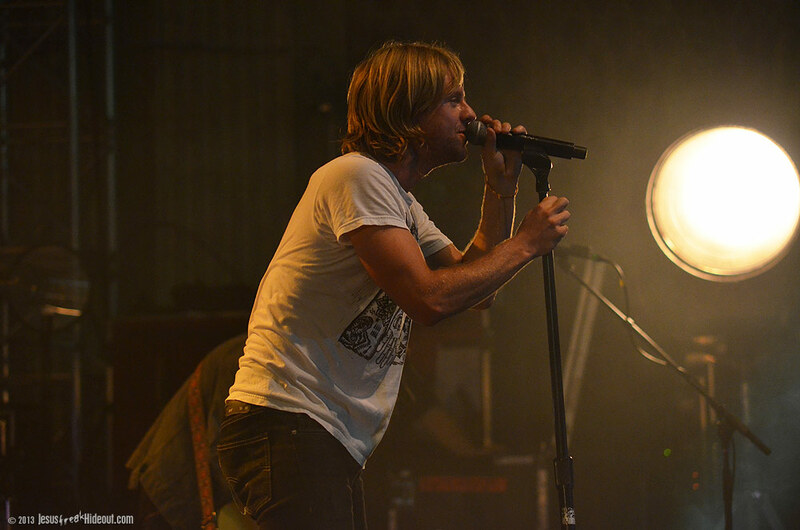 The California five left the audience cheering for more for a bit before returning. 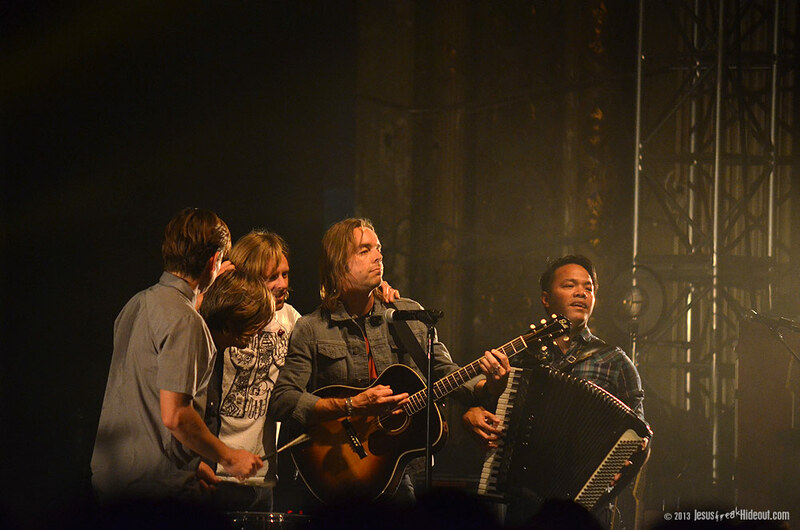 The guys then gathered around one microphone with their instruments to perform "Hello Hurricane" entirely acoustically, with the intentions of giving it a more "campfire" intimacy (Jyro returned to the accordion for this one, too). 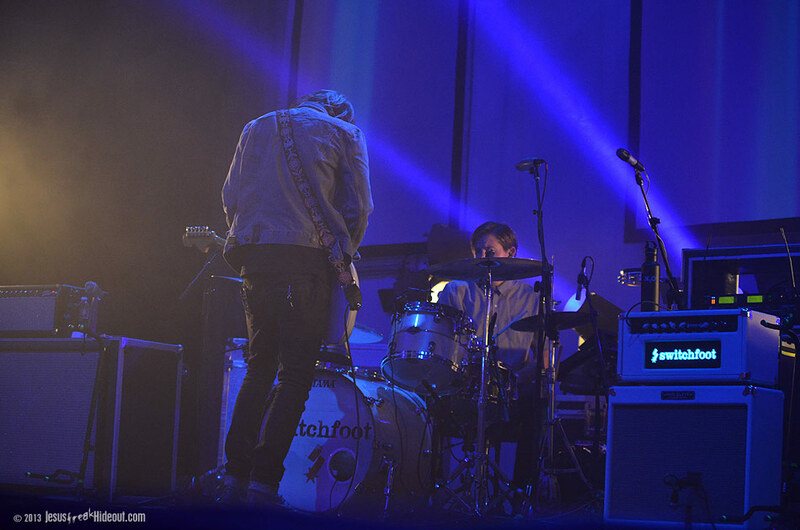 They then utilized the full band sound to present the last new song of the night, "Love Alone Is Worth The Fight." 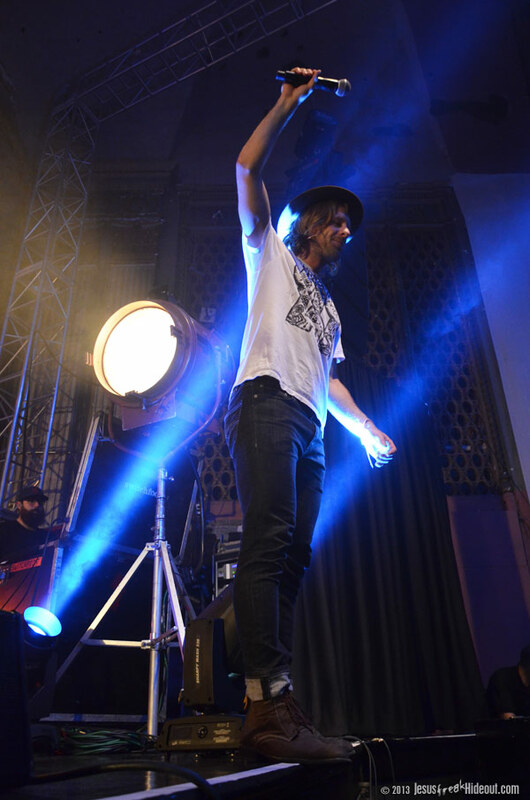 Jon once again ventured out into the audience to sing with the enthusiastic Glenside audience. 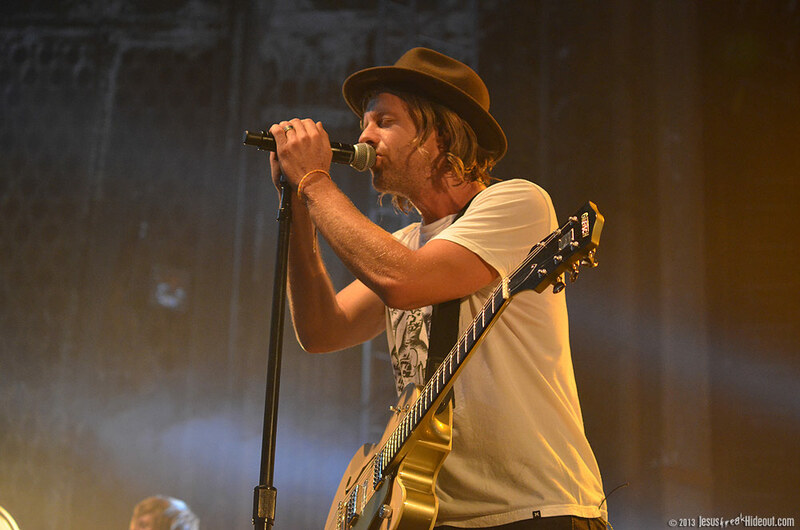 After the song, he confessed that they don't usually do three-song encores on this tour, but wanted to offer Glenside one last song, and they performed the incredible "Where I Belong" from Vice Verses. 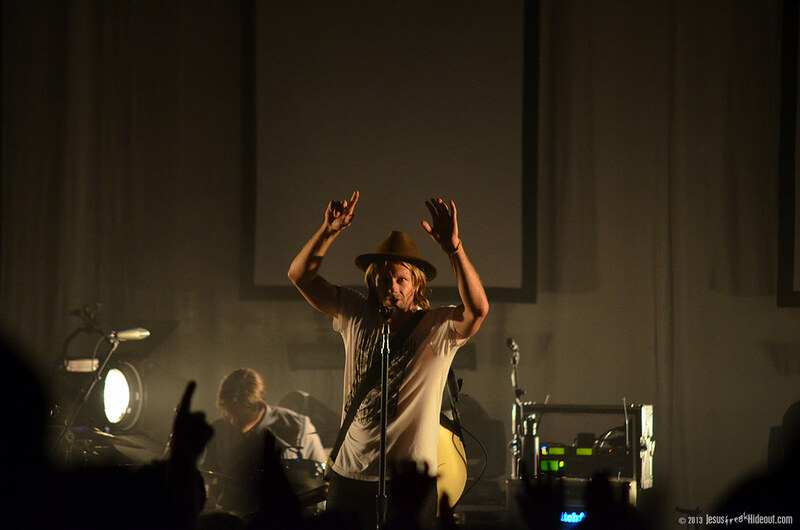 It's an amazing live moment each time, and tonight was no different. 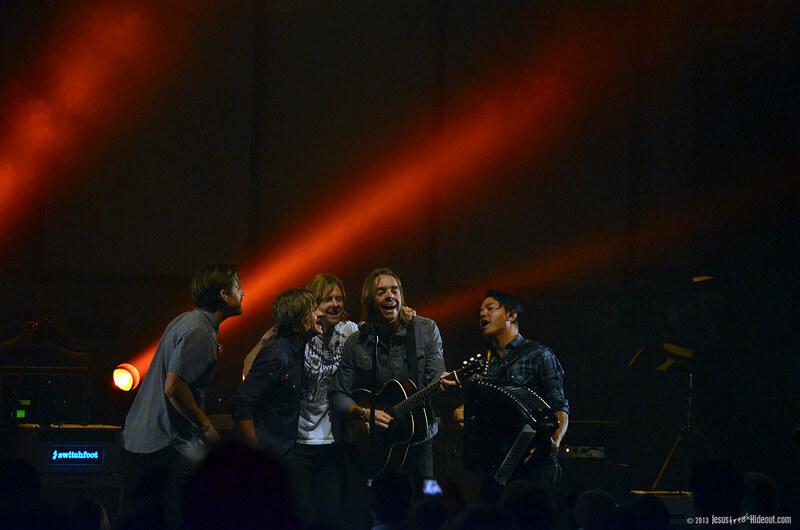 The guys then huddled together in the center of the stage to take a final bow and wave goodbye before leaving. 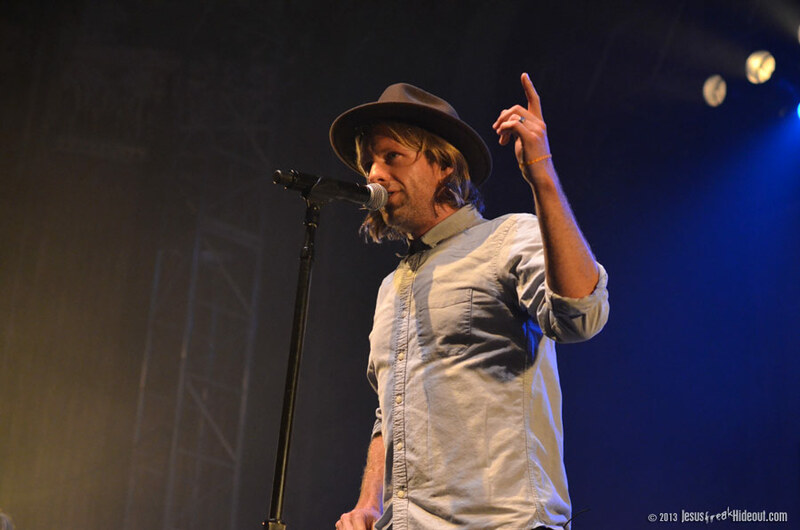 Jon Foreman typically will post on his personal Twitter account the place and time of a special "after show" performance he will do with just an acoustic and no mic or additional equipment. 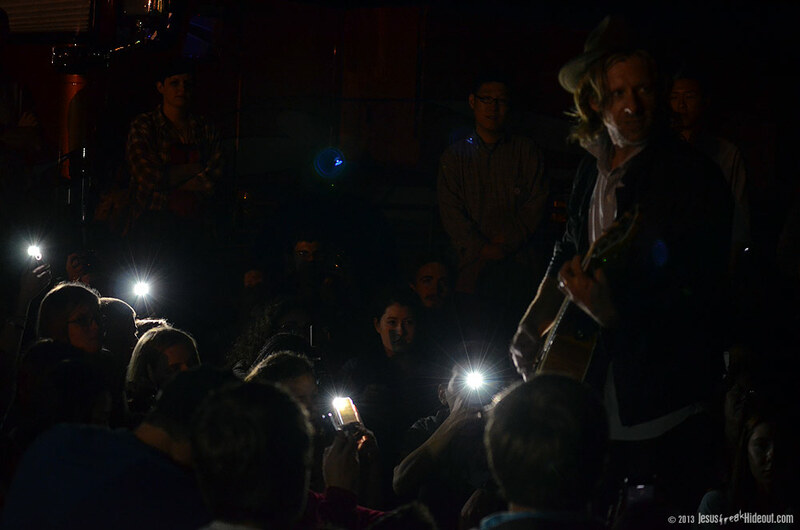 It'll often be in a parking lot or on a street corner, and anyone willing to stick around will get to hear a few more live songs. 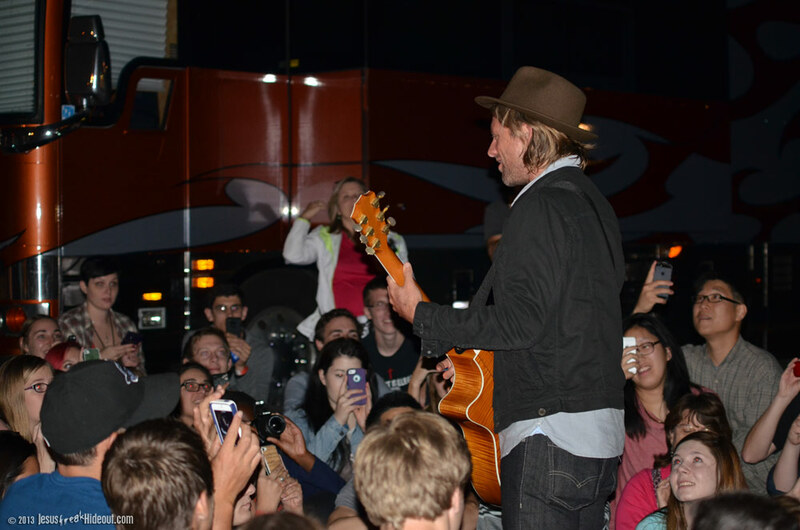 On this night, knowledgeable fans slipped outside and waited in front of the Keswick sign for a little while until it was evident that there would be no after show. 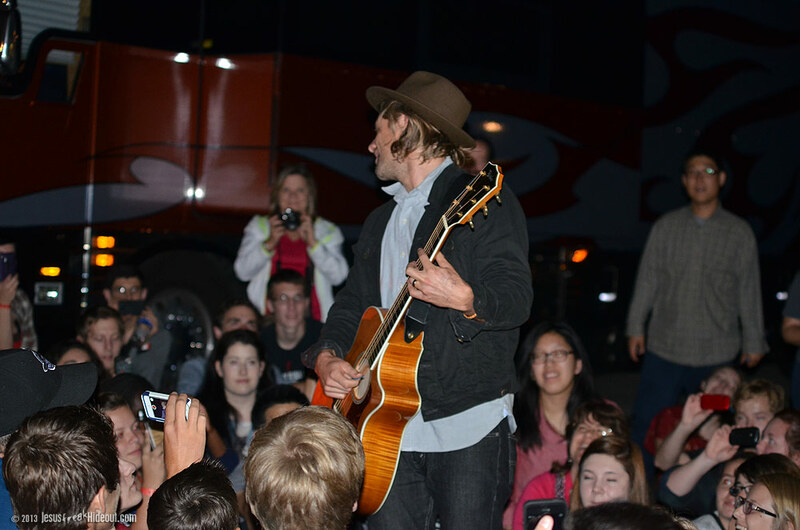 We, and a few other stragglers, decided to check the parking lot out back to see if we were missing something and found a sizable crowd had gathered near the band's bus. 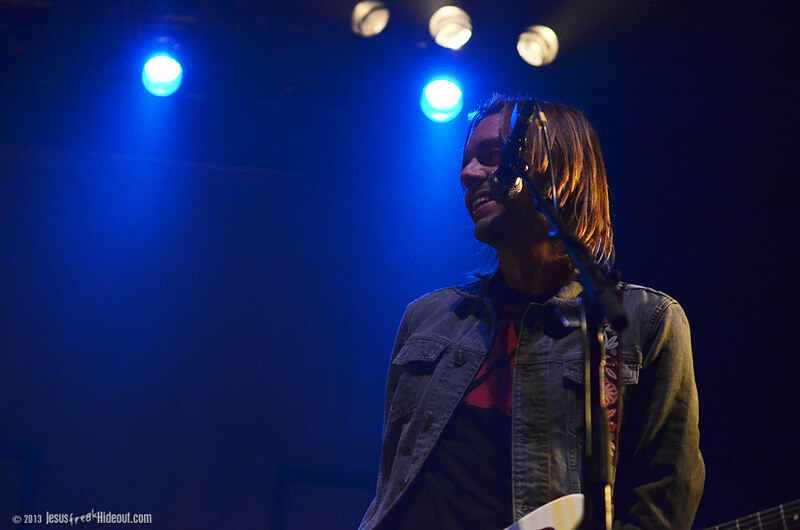 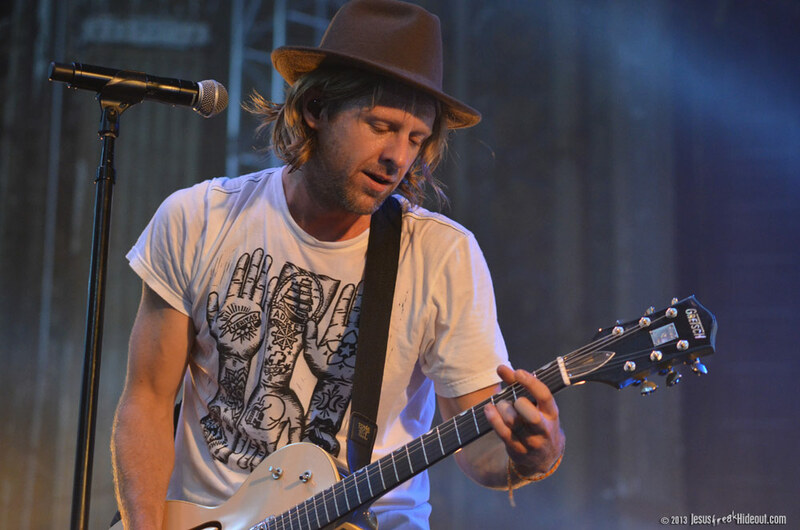 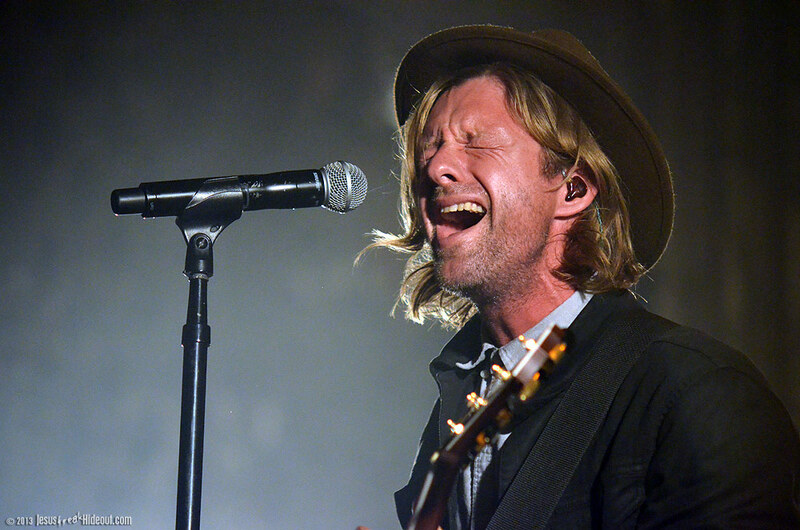 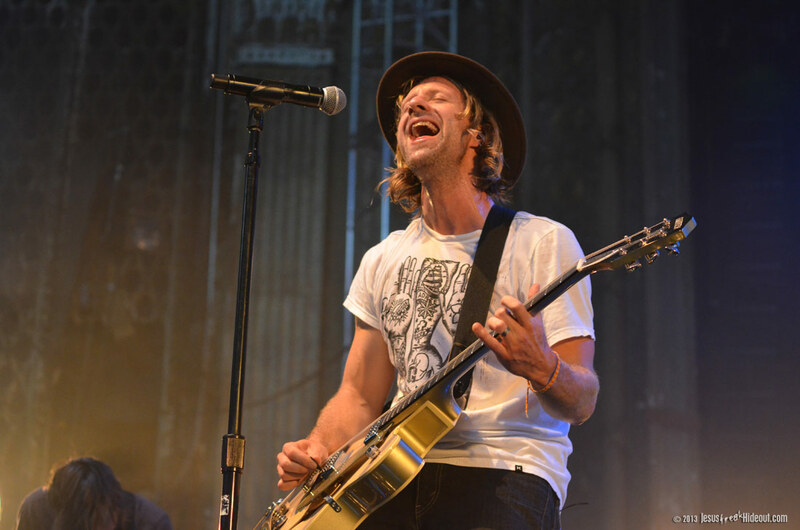 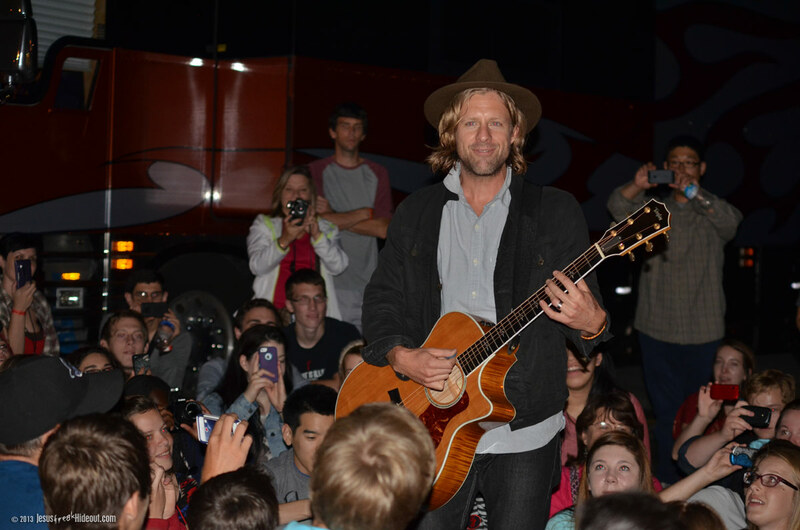 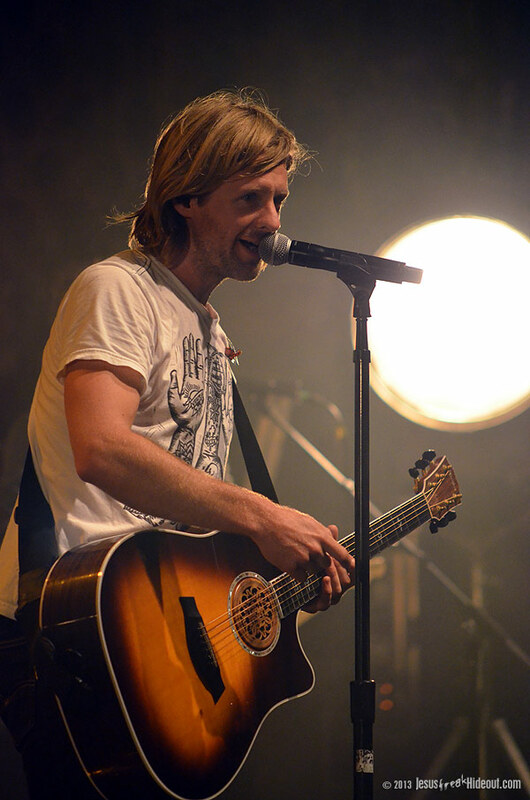 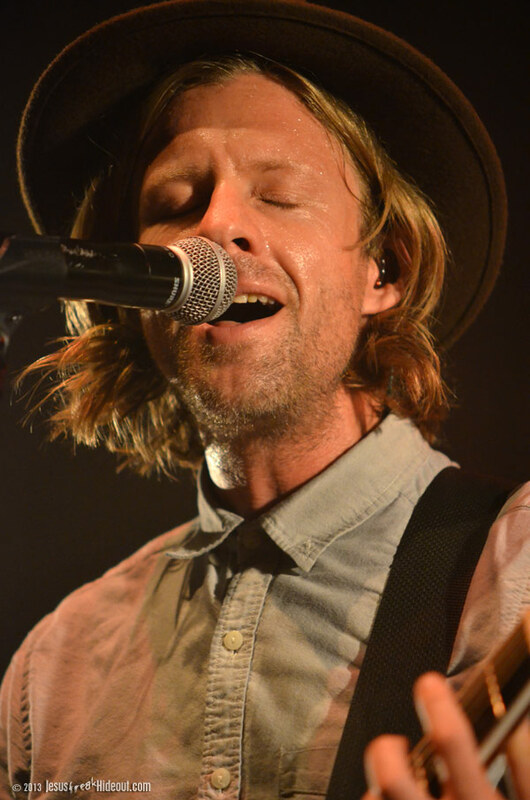 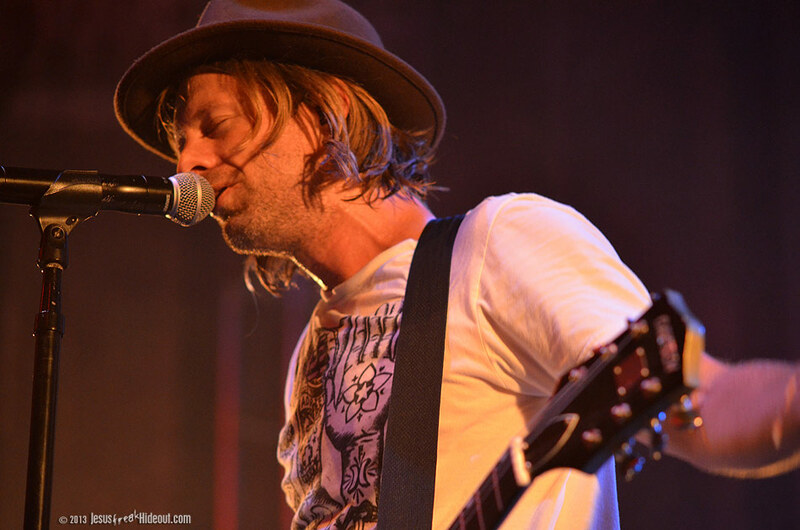 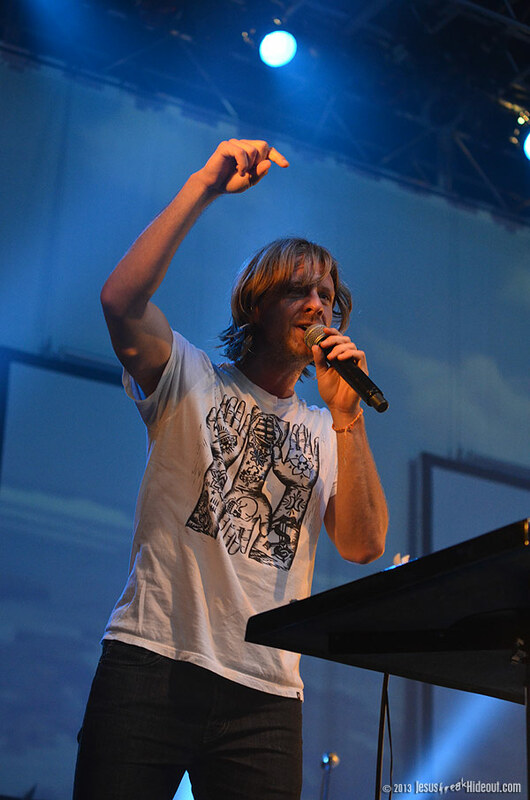 The waiting around continued for quite some time; it was officially an hour after the band's stage performance ended when Jon Foreman emerged from the venue and grabbed his acoustic off the bus, ready to serenade a music-hungry fan base. 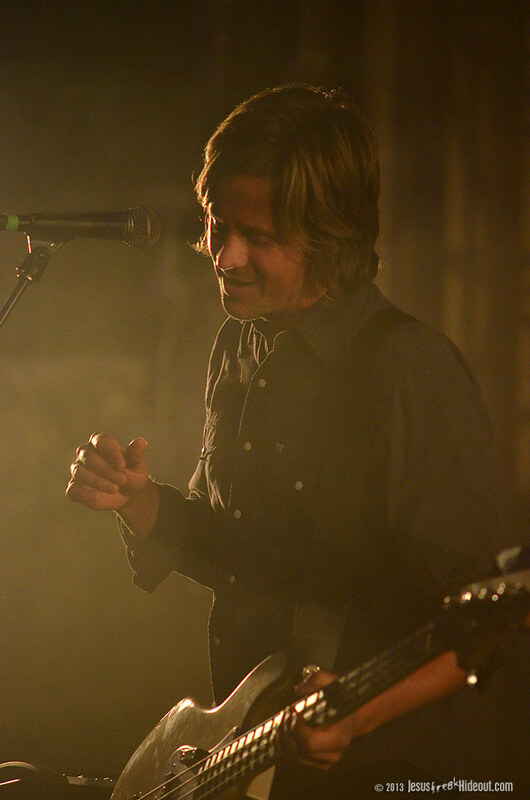 With gratitude on his lips, Foreman proceeded to play a handful of songs, including Fiction Family's "Just Rob Me," before asking the onlookers to choose the next song. 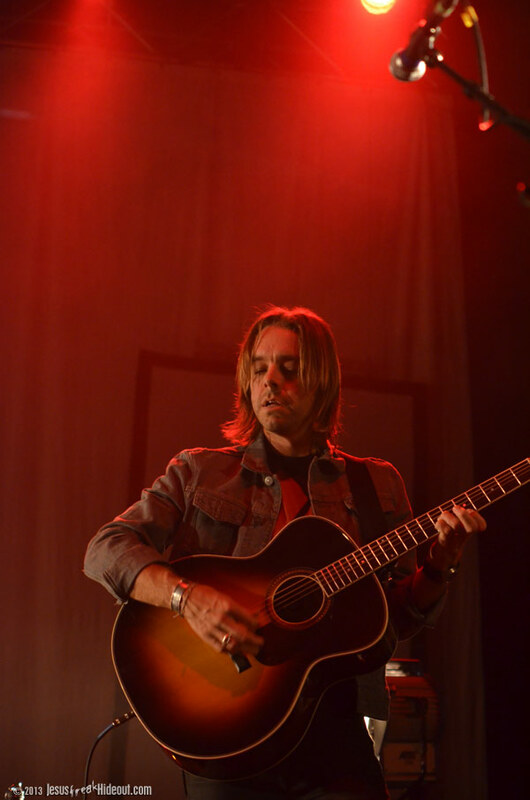 Foreman gave the option of either "Company Car" or "Stars," but the audience seemed so split evenly on those songs that Foreman decided to play both. 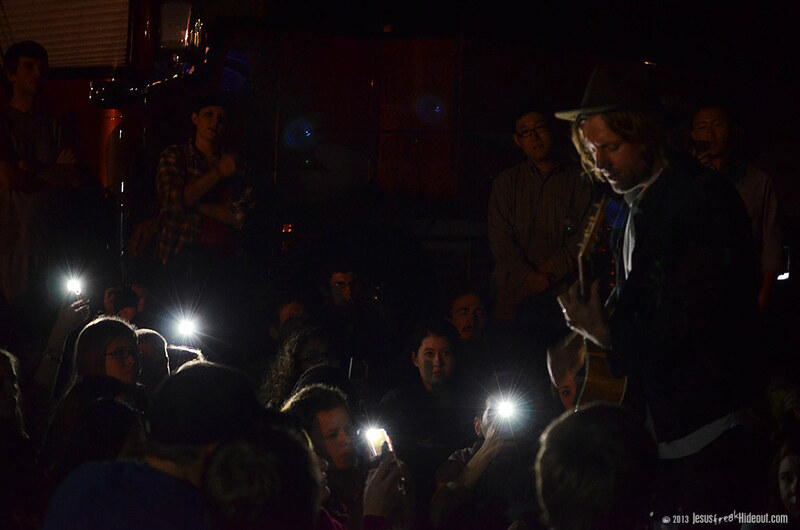 After thanking the audience for their enthusiasm and encouragement, Jon closed with the worshipful "Your Love Is Strong," playing by the glow of cell phone flashlights, with the parking lot crowd singing along passionately. 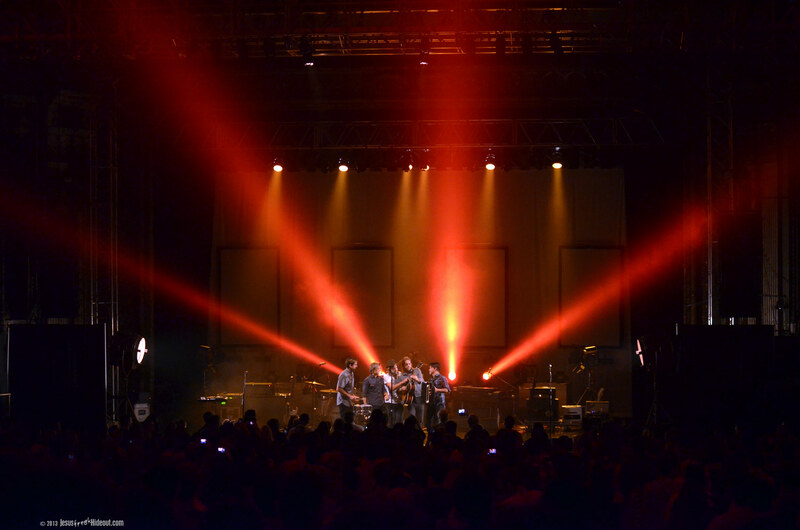 The Fading West Tour is certainly one of the more unique tours you can experience; it's a rarity when a band makes a movie and fuses a screening of it with a live concert. 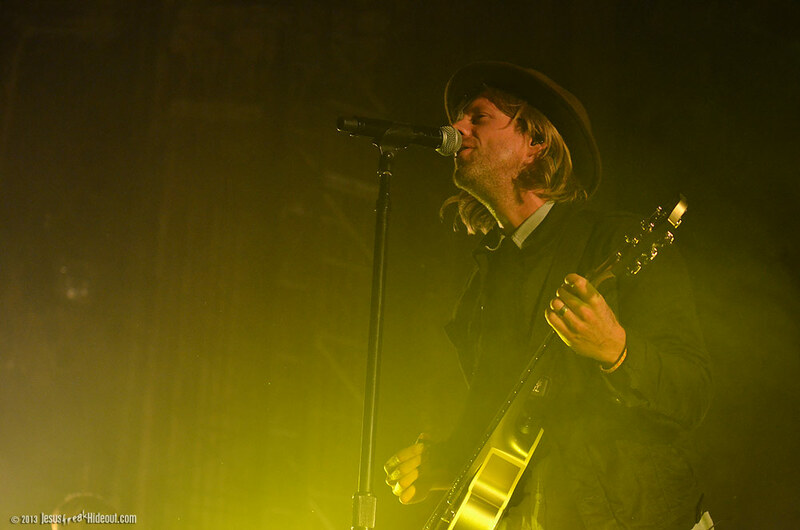 Switchfoot has proven once again to be a cut above a lot of the current rock bands and this tour really shows how special this band of brothers truly is. 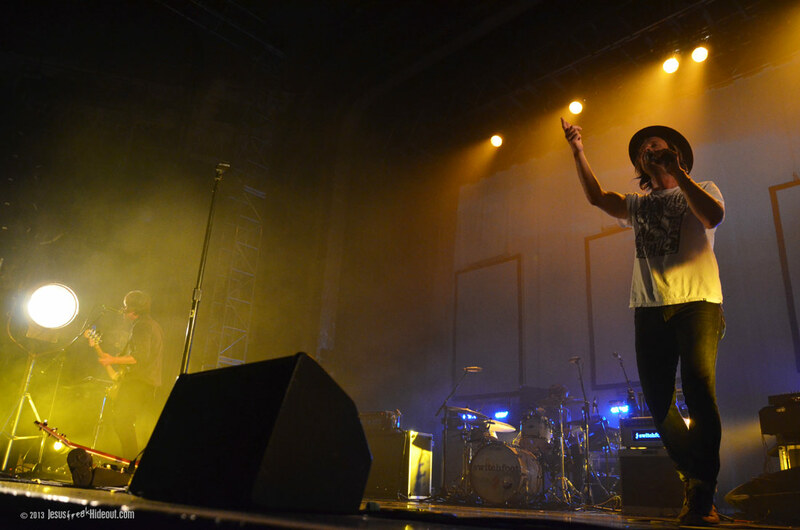 Don't miss this tour!